Viewing animals and being able to impact them as little as possible is one of the keys to being respectful of wildlife. 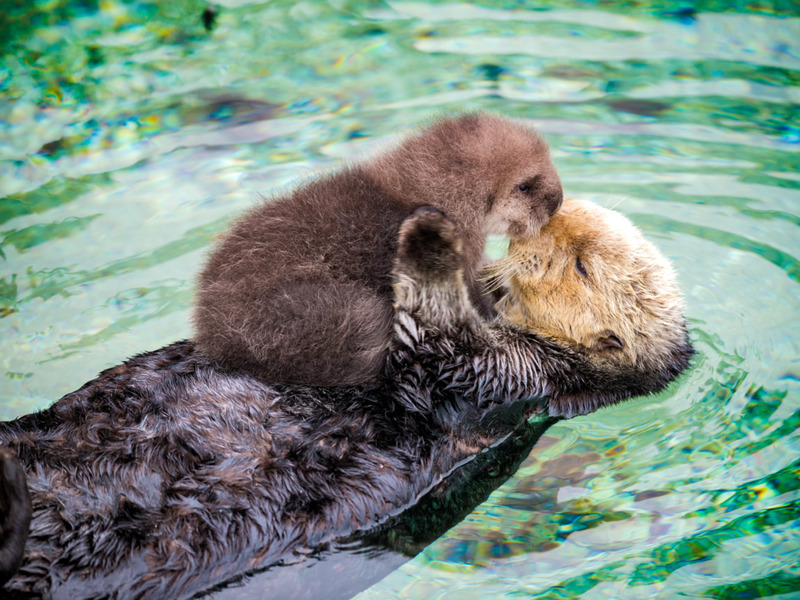 Practice behavior that is respectful to sea otters and all wildlife when sharing their space. Encourage others to think about the needs and well‐being of sea otters when they are viewing them. Be proficient at handling and maneuvering your watercraft, whatever type or size of craft you are operating. Sea otters are without a doubt the most popular animal here at the slough. Also known as the southern sea otter, this subspecies of otter is found from California to Washington with other subspecies found in Alaska, Canada, Russia, and Japan. Here at the slough they can be found in open water or hauled out on the mudflats in the main slough channel, from Moss Landing harbor to Hudson Landing, but are most common in the North harbor area. Otters eat clams, crabs, oysters, abalone, sea urchin and other small marine species including the fat innkeeper worm. Sea otters eat approximately 25% of their weight in food each day. Adult female otters give birth to a single pup nearly every year. Pups are born with long hair – ready to keep them warm and buoyant right from birth. They are so buoyant in fact that they cannot dive underwater. For the first few months of the pup’s life it's home will be on its mother’s belly, where it will be nursed, constantly groomed, protected from predators, and completely dependent upon its mother for survival. When the mother needs to forage for food, she will briefly leave her pup anchored in kelp or sea grass until she returns. When left alone, pups will call for their mothers. It’s common to see sea otter mother and pups in the Elkhorn Slough. Our protected waters make for a perfect refuge. For the first time ever, a sea otter pup birth was witnessed in the wild by researchers in May of 2011. Harbor seals favor near-shore coastal waters and are often seen at sandy beaches, mudflats, bays, and estuaries. They are found throughout the main channel of the Elkhorn Slough including the Moss Landing Harbor, the mud flats by the mouth of the Slough and of course, Seal Bend. Harbor seals spend their entire lives along the same stretch of coastline. To guard against California’s cold water temperatures, seals maintain a thick layer of fat beneath their skin, giving them a thick sausage shape. They spend many hours during low tide hauled out on a favorite sandbar or rocky island soaking in the warm sunshine. Harbor seals are the most vulnerable when out of the water and will quickly swim off if you get too close. Harbor seals have spotted coats in a variety of shades from silver-gray to black or dark brown. They reach five to six feet (1.7-1.9 m) in length and weigh up to 300 pounds (140 kg). Males are slightly larger than females. Harbor seals hunt for fish, crabs, and shellfish during high tide. Adult harbor seals can stay submerged for up to 30 minutes, but dives usually last only about three minutes. A two-day-old harbor seal pup can stay submerged for up to two minutes. With a wing span of nearly 79 inches, the Brown Pelican is hard to miss. It can be seen along the beaches and open water, gliding effortlessly close to the waves, and diving from great heights for food. Being the only dark pelican, they are easy to identify. They are found locally throughout the Bay along all of its beaches and coastal waters, and hanging out at harbors and wharfs and boardwalks hoping for a handout. From heights of up to 70 feet, the pelican uses keen eyesight to locate fish under the water. Pelicans dive straight down using the large pouch on their bill as a dip net to catch one or more fish at a time. Occasionally, large schools of fish come into Elkhorn Slough and visitors have observed an impressive spectacle of over 200 pelicans engaged in a diving and feeding frenzy from Kirby Park or Hummingbird Island. They of course feed on fish, their local favorites being anchovies, sardines, and topsmelt. Brown Pelicans are long-lived (over 30 years), social, and gregarious. Pelican parents work together to build nests, incubate eggs, and raise young.